Apollo 18 joins the ranks of Cloverfield, Quarantine, Paranormal Activity, The Fourth Kind, and the granddaddy, The Blair Witch Project, in using the false document technique in order to make the horror more effective. It’s the same story: something went down where people died, and these people captured it on film or video, and now here’s the footage that’s been found and edited…so you can watch it at your local multiplex! I generally like this technique, as it is particularly effective. There have been criticisms in the past about the camera shaking too much, and this has always been a problem point for those trying to use this technique, because authenticity is everything. This is where Paranormal Activity has skirted the issue, because with a multi-cam setup throughout the house, the cameras can pick up everything, or almost everything, and there’s no human running with a camera. The Fourth Kind also basically had a static camera…but dammit, the interference from the “aliens” always made sure there was something blocking us now and again. Apollo 18 has the exact same problem The Fourth Kind did, in that its over-efforts to authenticity actually wreck its chances to be more effective. This movie is certainly better than that one, however. So the story goes, Apollo 17 was the last moon mission and the end of the Apollo program, but the one we Americans didn’t hear about was Apollo 18, because the records have been sealed, until now, so that the Weinsteins can try to make money off of it. We focus on two astronauts, Anderson and Walker, who have been sent to the moon to do the usual, or so it seems. Some early footage in the film shows something going on with the rocks, but something always interferes with a good shot and a good look at what might be going on. The astronauts’ exploration of the moon eventually leads them to an abandoned lunar module parked two clicks away…the Russians left a lunar module on the moon, and it looks like they’ve been covering up something. Then Walker gets attacked by something…crawly. Anderson helps him, but it looks like whatever got Walker is making him sick, and perhaps deadly. Anderson thinks the Department of Defense knows what’s going on, but they won’t tell him. All of this is captured by stationary cameras, and one handheld, but Apollo 18, as alluded to before, goes much too far with the authenticity part of it. As mentioned in The Fourth Kind review, video cameras tend to already cut out our fakery filter. We tend to believe what we see, so there’s no reason to add vertical hold problems or static or any other kind of interference. It might be “authentic” and it also might add to the mystique, “we never got a good look, but what we saw was frightening.” However, it’s also frustrating, even more so than a shaky cam, and unnecessary. I say, you get some static going here and there, but only use it to “time” your scares, not obliterate them. Apollo 18 has quite a few effective moments doing just that. 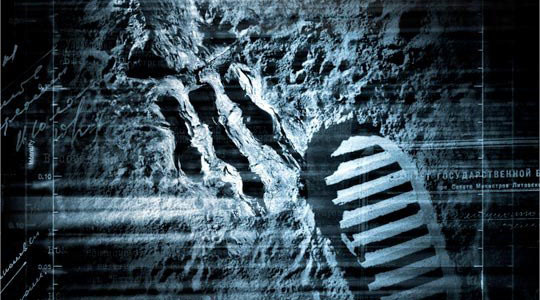 Apollo 18 has some definite scary parts, and it’s a brisk experience. So all-in-all, you can do worse. If you have any curiosity in this film, by all means take a look.